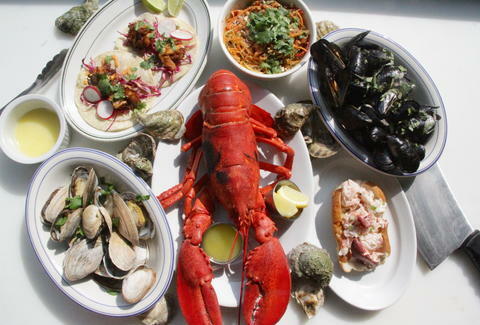 If you were imagining yourself face-deep in lobster rolls, mussels, and steamers mere blocks from the water this weekend, you're in luck/we should be friends, because Greenpoint Fish & Lobster Co. just opened, and is now letting you do all of those things without having to suffer through the Boston/"just outside of Boston" accents that come with going to the Cape. 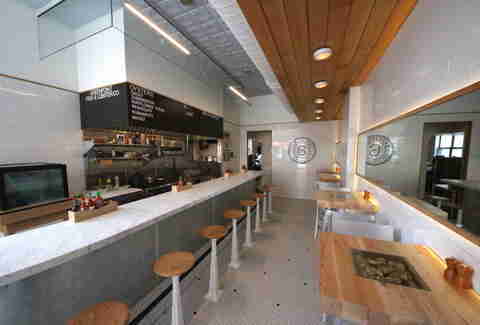 The narrow spot is awash in white tile and blonde wood, with a seating area surrounding a marble bar and open kitchen. The actual sit-down part of the restaurant (in the back) is preceded by a fish market and commissary up front, where you can grab to-go-ness like a dozen oysters and an oyster knife. 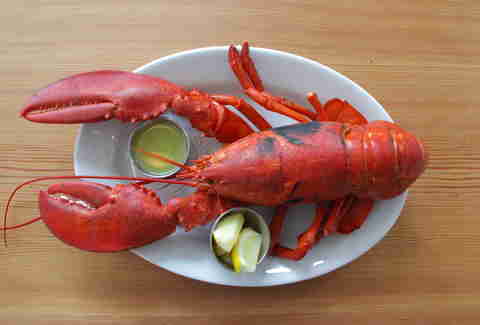 Proceed to sit at nearby McCarren Park or right on the East River, and shuck your own lunch. 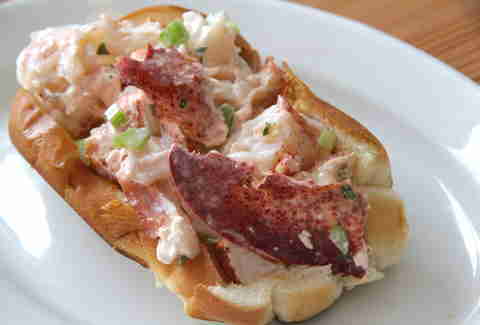 Everything here is as fresh as possible; there're new fish, oysters, and lobsters coming in daily, plus they actually hand-pick the lobsters for their lobster roll to ensure yours is up to their very high l-roll standards. Here it is -- just simple enough, and lightly dressed with mayo, celery, and other secrets they'd rather not divulge to us. Just get it. 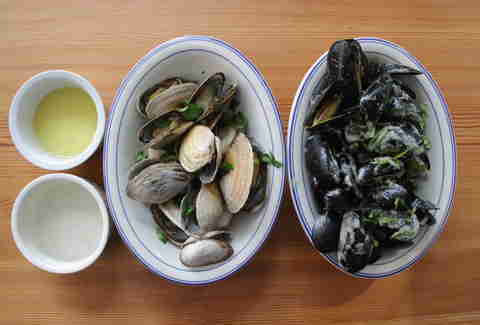 If you're here for a fuller meal experience, grab a table or stool and tuck into some classic steamers or their Thai-style green curry mussels topped with Thai basil. 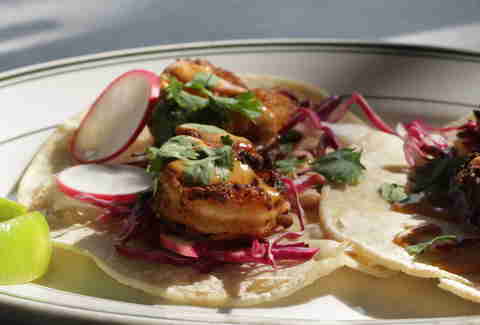 The fish tacos come grilled or fried (so... fried), and are totally dependent on the best fish they can get at market. Right now they're doing North Carolina shrimp with chipotle mayo, red cabbage, cilantro, and radishes for a little crunch. Or don't think too hard, and just get one of these beauties. 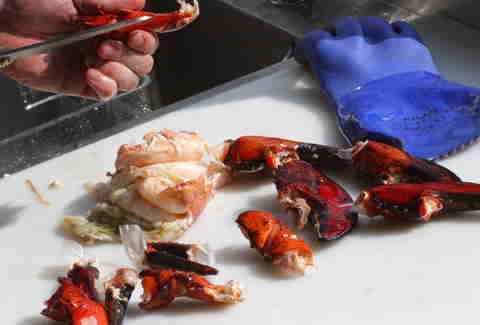 Andrew Zimmer is Thrillist's NYC Editor, and he'll be working on his shucking skills for the rest of the Summer. Follow him on Twitter and Instagram.